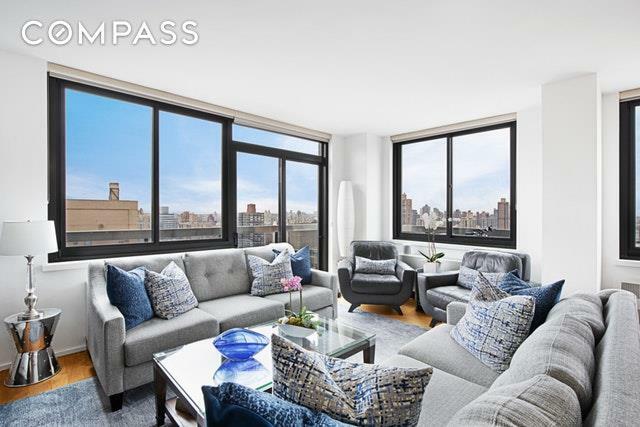 Live above it all in this corner two-bedroom with two private terraces in the Upper East Sides Premier White Glove Building. 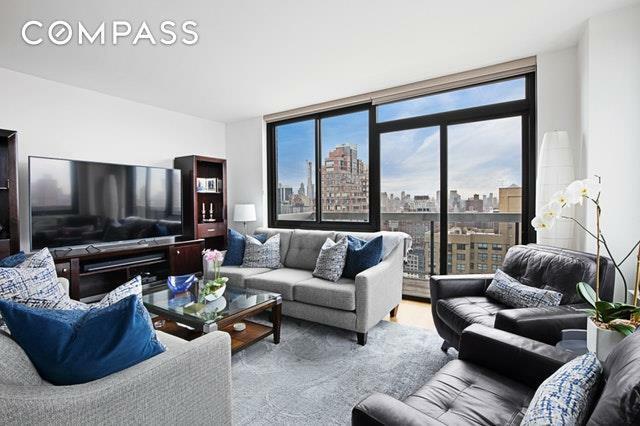 Convertible to a 3 bed (see alternate floor plan) this apartment is currently a lavish two-bedroom/two-and-a-half bathroom home. 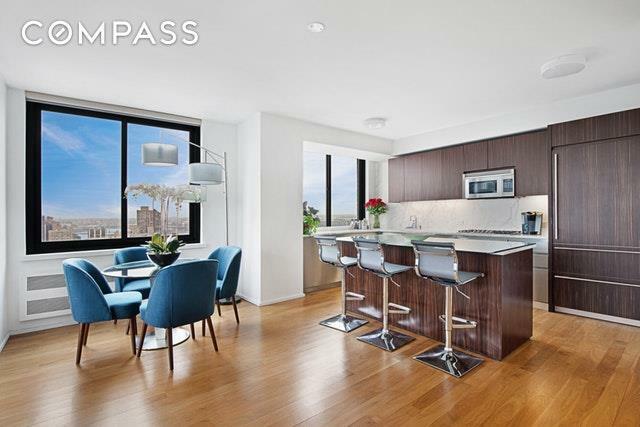 Unbelievable views west and north with incredible light, this spacious home is nestled on the second highest floor in the building, just below the penthouse. An expansive living/dining area with open kitchen is great for entertaining. The master suite is generous, with two walk-in custom closets and a large ensuite bath. A second bedroom also features an en-suite bath. Additionally, there is a powder room and foyer with coat closet, as well as a washer/dryer. More features include natural walnut floors, a custom kitchen with ebony Macassar upper cabinetry, Calcutta Gold marble counters and backsplash as well as stainless steel drawers. Appliances include Viking convection microwave oven with hoods, Bosch five-burner cooktop, Bosch oven, Sub-Zero refrigerator, Miele Incognito dishwasher, and Dornbracht fittings. The bathroom has Emperador brown polished marble slab countertops, ebony Macassar cabinetry, crema d'orco stone wall tiles, and honed piombo floor and wall tiles. There are 40,000-square-feet of residential amenities that are a must see including one of the city's largest private parks, a resident only private spa, a 56' indoor salt water pool, two Jacuzzis, top-of-the-line fitness center with rock climbing wall and squash court. There is also a creative arts studio, fitness studio with exercise classes, a children's playroom, and outdoor sun lounge. The building has 24-hour doorman and porter services, an in-house parking garage, and valet parking service. 72nd Street and York is a cul de sac, reducing noise and traffic and you will be two blocks from the 2nd Avenue subway! 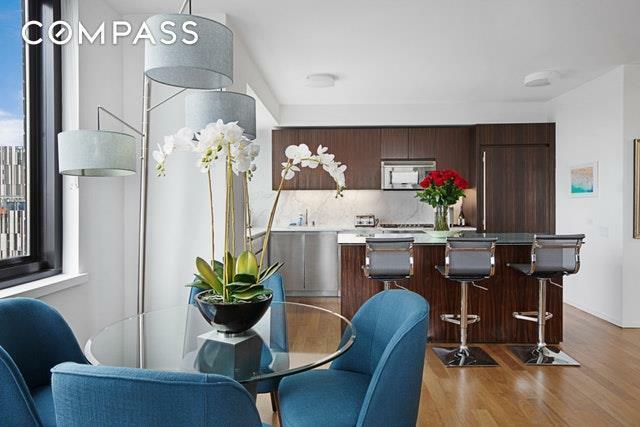 Listing courtesy of David Margolies of Compass.